Euromoney's interview with Polish finance minister Marek Belka gets off to an inauspicious start. After returning from a lovely holiday in Jamaica, perhaps he is feeling a bit tetchy. Or perhaps he is under rather a lot of pressure at the moment. First, the minister cannot understand Euromoney's accent. "I always thought my English was good enough to understand but I don't understand you." Then the language problem miraculously clears up, because there is a content problem with the first question - about economic growth. There is a lot of frenetic room-pacing by the minister and negotiations with the press officer about whether Euromoney could be booted out with an empty notebook into the snowy streets of Warsaw - and straight back to London. "I don't want to talk about general economic policies, I am sick of talking about this," he says, finally throwing himself down in a chair. This is a shame, and not just for the prospects of the interview, since Poland's economic growth, or rather its lack of growth, is a subject on all Poles' lips. For the new coalition government led by the Democratic Left Alliance (SLD), elected last September, creating growth - with 5% projected for 2004 - is a key tenet of the newly approved budget to kick-start the economy and tackle unemployment levels of 18%. Economic growth has almost slowed to a standstill, the worst period of stagnation in a decade. Growth in 2001 languished at around 1%, down from the annual average of 6.3% between 1994 and 1997. Investment recorded a negative growth rate in 2001. Suddenly, Belka warms to the conversation when he gets down to what he sees as the nitty-gritty causes of this slowdown - the monetary and fiscal policy pursued during the years the last government was in power. "Macroeconomic policy has been messed up hopelessly in the last few years," he says. "We have the worst combination of all: an overly restrictive monetary policy and a chaotic, untransparent fiscal policy. The first thing to speed up the economy would to be to start correcting this mix. Unfortunately, there is no serious discussion of monetary policy and its efficiency in Poland." All this has brought the government into a head-on clash with those deemed guilty of this overly restrictive monetary policy, Poland's independent central bank, the National Bank of Poland. The main area of contention is the decision of the bank's Monetary Policy Council (MPC) at its February meeting to keep interest rates at 10%, when inflation has now been brought down to a post-Communist low of 3.5%. After the meeting, the MPC argued that the interest rate had to be kept at 10% because of the cabinet's refusal to lower borrowing costs or keep government spending within the cabinet's target, when Poland already has a hefty budget deficit of 5% that needs to come down before it can join the EU. Belka says this has caused a deep disequilibrium in a stagnating economy and that interest rates must fall to boost growth. "I accuse the monetary policy of being untransparent, unconvincing, backward looking and obstructing the general situation in the economy. Industrial inflation is zero, investment demand and the current account deficit is falling and the output gap is minus 4%. I want the bank to acknowledge this very basic fact. It's not a normal situation that the economy is growing at 0% or 1% and unemployment is growing very fast." Current interest rate levels also make the cost of servicing public debt very heavy - this alone accounted for 50% of the increased spending in the new budget. 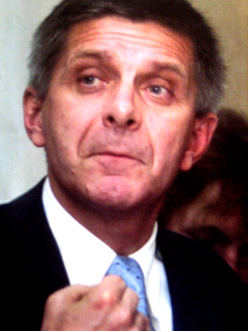 Enter Lescek Balcerowicz, president of the National Bank of Poland and architect of Poland's shock-therapy reforms when he was finance minister in the 1990s, a period of rapid privatization. He argues that short-term tinkering with monetary policy is no way to stimulate growth or tackle the budget deficit and that hard-won improvements to Poland's macroeconomic conditions cannot be compromised. "Over the last few years, we have seen a radical reduction in economic risk in Poland," he says. "The current account deficit has been reduced from 8.3% to 4%, inflation has been reduced from to 3.5% [from 18.5% in 1996]. These are very important macroeconomic achievements that must be preserved for economic stability." But Belka believes that interest rates can be cut without fuelling inflation. "The 3.5% inflation we have now we can elegantly live with, even up to the very point of entering the EU," he says. "In mid-November when we met with Balcerowicz, I asked him what the CPI inflation would be at the end of the year. At that time he said it should be somewhat lower than 6%. It was 3.5%. For the fifth year in a row, we will probably undershoot the inflation target, which is OK. But if it's done at the cost of suffocating the economy, this is not worthwhile." Balcerowicz favours the approach of the IMF and European Bank for Reconstruction & Development that supports the promotion of further fiscal and structural reform by the new government. "This year the government is only looking to raise Zl6.6 billion through further privatization. The best response to overburdened public finance is to complete the privatization process," he says. Belka says he is aware that monetary policy cannot sort out Poland's ailing economy on its own. "Further consolidation of public finance and further structural reform are an obvious necessity. You should never treat the relaxation of monetary policy as a panacea. But Balcerowicz says 'well you shouldn't discuss monetary policy - we have done what was needed' and that the government should concentrate on the reform of fiscal policy, structural reforms and so on. My answer would be 'I know what to do but I don't accept the view that everything possible in the realm of monetary policy has been done.'" Balcerowicz defends the decision to maintain interest rates at 10%, arguing that the current rates are in line with the experience of transforming economies in western Europe. He cites the example of Finland between 1989 and 1992, where a steep decline in inflation to around Poland's current level of 3.5% was also accompanied by interest rates of over 10%. On top of that, he points out that since February the bank has cut interest rates almost in half already, from 19% to 10%, and that some of the cumulative effect of this reduction, particularly the 150bp cut in January, has still not been felt by the economy. "Taking inflation into account, real interest rates have already fallen from 11.6% to 6.3%, 5.3 percentage points, in the last year." The trouble is that the government looks at the real rather than nominal interest rate, and some bankers feel that a real interest rate cut of 5.3% looks pretty paltry. "The central bank has lowered the rates already by 900 basis points but that has been accompanied by a marked decline in inflation, so in real terms the rates have not come down very much, if at all," says Peter Malik, director in the emerging markets group at CSFB. Belka argues that the NBP has not really looked at real interest rates before. "It's only very recently that they switched to a core inflation policy. Previously they could always find one indicator that justified whatever decision they were going to make." But Balcerowicz rejects the idea that interest rate calculations are misleading. "The official interest rate is 10%. This is not the assumed rate." Opinion is mixed as to who is right. "The NBP is known to have strong views and is not easily swayed," says CSFB's Malik. "Balcerowicz has been keeping interest rates at a level that monetary purists would probably consider appropriate but to restart growth by 2003 the government needs lower rates." Wike Groenenberg, director of eastern European research at Schroder Salomon Smith Barney, also accepts that 5% growth by 2004 will be tricky without cuts but that this is no long-term solution. "In the short term, monetary policy plays an important role in influencing economic growth," she says. "Indeed, high interest rates were a key factor behind the economic slowdown over the past year. But in the long term, the story is not so much about the level of interest rates but about the impact on the competitiveness of the government's industrial, regulatory and fiscal policies." The public spat between government and the central bank came to a head in early March when Balcerowicz was summoned to address parliament as deputies debated a motion to reprimand the central bank for keeping interest rates high to the detriment of the economy. He was summoned after deputy president Andrzej Bratowski had appeared before deputies, only to be told by one that he appeared to be intoxicated. Balcerowicz wrote an outraged letter about the way a public official had been treated. Neither did he pull punches in the debate, telling heckling deputies that "political pressure will not be regarded by the National Bank of Poland as an argument for monetary policy decisions". Nevertheless, the non-binding motion was passed by 304 votes to 104. Belka says he didn't sanction it and that the motion has little clout. "What happened recently, when the parliament passed a resolution, was just an expression of frustration of deputies with the general economic situation," he says. However, Balcerowicz views this a lot more seriously: "This is unprecedented and not to be regarded as something normal," he says. "Nobody would envisage a situation in any western economy where the parliament could put pressure on the independent central bank to change its policy, and if it did not, deprive it of independence. This is not just a dispute; it's post-communist language - an act of aggression. And this motion was passed after significant interest rate cuts." The motion is all the more ominous because there is a bill in the pipeline proposed by the Polish Peasant's Party, part of the ruling coalition, to change the central bank's charter. The proposed changes would oblige the bank to take into consideration employment levels and growth as well as price stability when setting interest rates. It looks more of a possibility the longer the central bank holds out on further cuts. It could also increase the size of the MPC of 10 members, potentially diluting the MPC's current policy stance. Poland's president, Aleksander Kwasniewski, has already said that he will veto any attempt to change the central bank's charter and any such bill would also need SLD backing for it to be passed. Despite positive noises from Jerzy Jaskiernia, head of the parliamentary caucus of the SLD, prime minister Leszek Miller has not voiced support for such a bill. Belka doesn't support it either. "I have been against this initiative in the government and also publicly and I don't plan to change my view," he says. "I think it's very inappropriate and as a matter of fact, it will never be accepted by the government or the president." Analysts think it is most unlikely that such a bill will be passed since the independence of the central bank is a critical plank of EU membership, and EU membership is not far off if Poland joins as planned in 2004. Nevertheless, the mandate of the central bank could be changed and still be compliant to the EU's acquis communautaire. "It's not a good sign that the government wants to interfere in central bank policy," says Groenenberg, "but the government could decide to increase the number of people on the central bank board or say that interest rates should be set in cooperation with the government. All of that is consistent with EU policy but it would not be in the spirit of how the EU thinks a central bank should be run." Aside from the bill in question, is Belka against any change to the central bank's mandate? "I would strongly oppose any legislative measure to change the structure or the position or the public confidence in the central bank," he says. "This has to be made clear. In a situation like today, any chance is perceived, and properly so, as an attempt to weaken the position of the central bank. As critical as I am of the bank, we are alarmed at the idea that we could destroy institutions." This is probably just as well as the IMF has attacked any such plan, saying that it could destabilize the economy and damage investor confidence. The European Central Bank has also jumped into the ring and said that by changing the National Bank of Poland's anti-inflation mandate, Poland could find it harder to join the EU. So what will happen with interest rates now? Analysts' views are mixed - some argue that the sort of pressure being exerted by the government is counter-productive as it will only steel the central bank's resolve. Others expect that interest rates will be lowered at the end-March meeting of the MPC due as Euromoney went to press. Raffeisen Zentralbank predicts there will be a 100bp reduction in rates then and a further 100bp reduction in the second quarter, some think the first cut will happen this month. "I'm convinced the central bank will reduce rates in the near term, possibly in their [end-March] meeting," says one analyst. "I think we will see interest rates at 8%-8.5% in the middle of this year, with two more interest rate reductions - one of 100bp [for March] and another one of 100bp [in April]." Balcerowicz will not be drawn on what the outcome of the March meeting might be, saying, "it is not our policy to speculate on whether we will cut rates." But if his current view of the parliament's action is any indication, he was completely unmoved in his views as Euromoney went to press. "Our goal is to stabilize inflation this year and next year below 4%," he says. "The only lasting contribution of monetary policy can be to stabilize the economy to allow conditions for growth." But Martin Stelzeneder, analyst in financial markets research at RZB, thinks that while some members of the MPC such as Boguslaw Grabowski are still against further interest rate cuts, the fact that no news has been heard from Balcerowicz on this issue is good news on this occasion. "I don't think Grabowski voted for any interest rate cuts last year, so this comment is not necessarily valid. As there has been no comment by Balcerowicz on the March MPC meeting, I expect more cuts." Belka is also circumspect about his expectations of interest rate cuts, although he says that the government and the central bank are in constant dialogue about this and many other issues. "Interest rates are important, but this does not mean that I expect a certain change in interest rates this month, next month or in three months' time," he says. "The most important thing for me is for the central bank and the MPC to acknowledge what the real situation in the Polish economy is and I think it is in a deep disinflationary disequilibrium. If they accept this, then the whole approach to monetary policy changes." When the government and the central bank will now settle their differences is debatable. "There's always a tug of war between politicians and central bankers," points out Malik. "Poland just has these arguments in a bit more of a loud form." True enough, but with investors getting increasingly anxious (see box below) and the IMF and EBRD voicing concern, both parties would do well to keep their voices down. Euromoney's Kathryn Tully interviewed Poland's finance minister, Marek Belka, in his Warsaw office and asked him about the completion of the country's privatization process and the government's fiscal policy. What are your main goals with the privatization process? The problem is that all the easy privatization projects are gone. Now we have sectors that require a more sophisticated approach. Take the energy sector. You cannot just organize a sell-out, the sequence in which you privatize this is important. Also the regulatory framework for processing privatizations is very poor - for the outcome, price and structure. Privatization is always a politically loaded process and not just in transition countries. That's a fact of life. The less control the state has, the better for the economy, of course. But we want to try to secure certain features in the privatization process. For example, after 10 years of doing this, we have learnt that when we are disposing of a state company the price is important and politically visible but it is by far not the most important thing. Much more important is the technology transfer, the quality of the investors, the opportunities for Polish citizens. Do you agree that the political appointments made recently in state-owned industries and the current dispute with the central bank amounts to the politicization of the economy? I do not agree. It depends on your point of view. The opposition will always think this. But I prefer to think of myself as a pragmatist. There is so much for the government to do, plus we are in a stagnating economy. There is a lot to do to build up industry, to process money, to sort out unresolved restructuring problems and there are a host of problems that the free market cannot solve. If you mean by politicization that we will be more proactive, then yes, we will have to be more active in the economy. What do you say to those who say that budget spending was too high this year? One of our first tasks was putting the budget together, which has just been passed by parliament. It's true that this provides for a big budget deficit but it's also true that it's half of the spending we could have agreed if we hadn't corrected many things and cut costs in many areas. There has been talk of the government channelling funds from state-owned companies into government projects. Is this true? Well, we have realized, for example, that the highways cannot just be paid for with private money. But we believe in reinvestment. We are still on target to keep half the proceeds, Zl6.6 billion [$1.6 billion], from privatization this year but we believe privatization should be subordinated to restructuring, so the other half of the proceeds from privatized assets will be ploughed back into restructuring. We are determined to use part of the proceeds to modernize sectors and companies. Analysts hope that the arrears owed by the government to the pension fund system, some Zl7.3 billion, will fuel an equity-driven rally in Poland's stock market. What are your plans for paying this amount? We haven't made a final decision about how we will pay back money owed into the pension funds. We are now paying our dues to the pension funds at the prescribed rate, but we are dealing with a heap of mistakes and payment arrears from the past government. The arrears were not because the state had no money, it was because of IT problems and problems with identifying accounts. The interest on the arrears will be paid in cash this year. With the capital we are proposing to pay with bonds but the decision will be made in a matter of weeks. What is important that we make a deal with the funds and that this should not destabilize the capital markets.